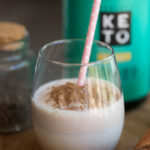 Whether you need some post workout recovery fuel, a tasty keto-friendly afternoon snack, or just an exotic-tasting change of pace, this vanilla chai protein shake will become your newest addiction. It’s anti-inflammatory, loaded with antioxidants, and can even boost your immune system. Instead of using plain water or unsweetened nut milk in your protein shake, use brewed black tea to provide more flavor and nutritional perks — without any extra carbs that can kick you out of ketosis. Chai tea is widely known for its powerful health benefits and has been enjoyed for centuries in India for good reason. Each spice contained in chai is unique in flavor and health properties. These spices and herbs work synergistically to create a health-boosting and comforting beverage. The clove and ginger in chai tea are highly anti-inflammatory and help reduce pain. Clove is widely used to fight painful oral diseases and ease headaches, while ginger can help soothe menstrual pain, headaches, and stomach pain. Ginger root has been studied extensively for its role as a digestive aid. It can help improve circulation, relieve stomach pain, and significantly reduce nausea and vomiting. Chai is loaded with polyphenols, which are antioxidants that help combat free radical damage inside your cells to prevent disease. Tea actually contains more polyphenols than some fruits and vegetables. Give your daily protein shake a massive health boost with chai tea. You will fall in love with this quick and easy exotic blend of flavors. Add all contents to a shaker cup and shake until well combined and smooth. Add a pinch of cardamom, cinnamon, and nutmeg for extra flavor if desired. Adjust sweetness with stevia to taste.